That would be the best course, foundationless, but I do not know any beekeepers in Europe that go foundationless and do not need to treat. I think Michael Bush is the one who has the most experience in this way. This is how the bees build, if they know how to do it and then they need not to be treated anymore. As I said, I know nobody in Europe who works foundationless and does not have to treat. Also there are some who work with small cells, but omit essentials and therefore must treat. The acids are actually just as bad for the bees as the other chemicals - they burn holes in the exoskeleton of bees, which are then naturally prone to disease. Erik from Sweden said, that the bees there, when the varroa arrived, resisted up to 20.000 mites per hive without showing DWV virus infection (deformed wing virus). 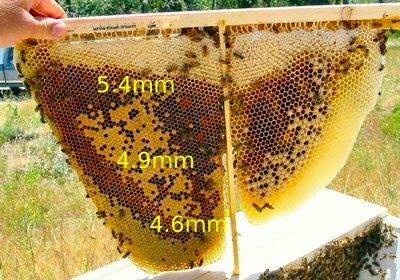 Then they began to be treated with acids, and the consequence was, that they weakened the bees so much, that already with 1000 or 2000 mites appeared the DWV virus. The interesting thing now is, that in Spain the resistance to the DWV virus is increasing (according to Dr. Fernando Calatayud, a biologist, Valencia, Spain). They do not treat there with organic acids against Varroa mites, but in Sweden they are used exclusively. This means that very likely the use of acids in the hives reduces the resistance against the DWV virus. This seems logical when one considers that these burn holes in the exoskeleton of the bee. So we see that all this has a lot to do with stress and the immune system of the bees is enormously weakend.